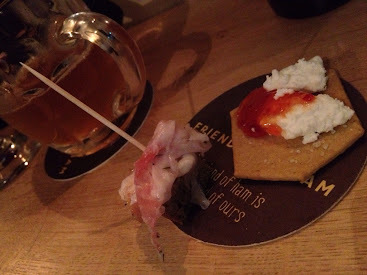 Last night I got the chance to have a sneak peek inside Friends of Ham, a charcuterie and craft beer bar which opens its doors to the public tomorrow (Monday 9th July) and looks set to be a huge asset to the Leeds beer scene. 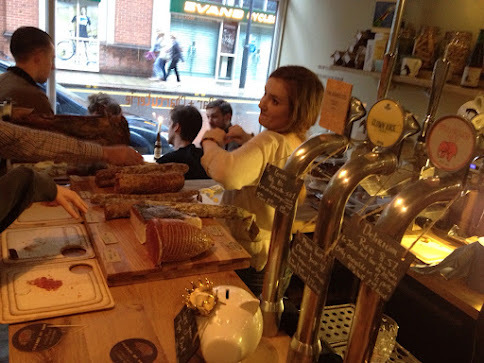 The idea behind the bar is a simple yet unique one: Artisan hams, charcuterie, cheese and posh bar snacks, served alongside a great range of draft and bottled craft beer. A British take on European tapas and Cafe culture. But an idea is one thing and reality is very much another, so I was genuinely happy to see that all Claire and Kitch's hard work had been put to good use. Friends of Ham rocks. For those that have never sampled this food of the Gods, it's essentially a very thin layer of meat with a very thick layer of white fat atop it, that is cured with herbs. Sliced very thinly it melts in your mouth like herb and ham flavoured butter, and was my favourite of many delicious things I sampled at Friends of Ham. The scotch eggs are also really excellent, particularly the black pudding ones. Yum. 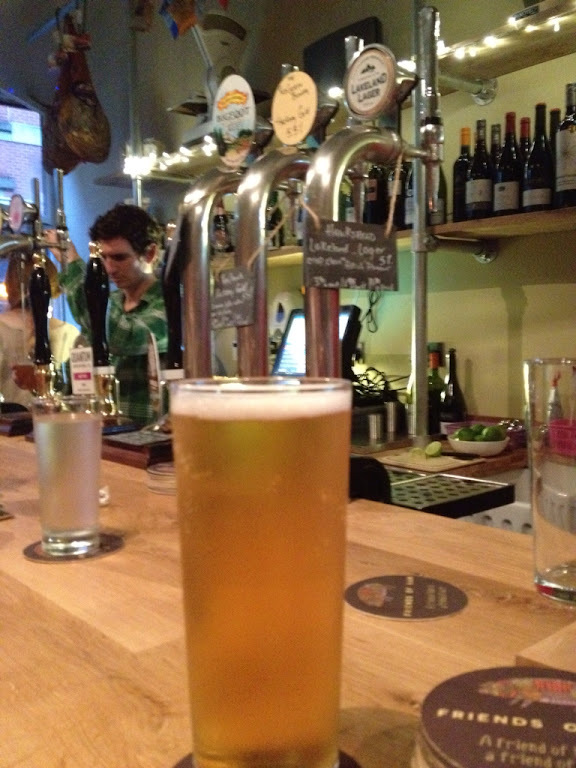 There was some great beer on the taps and in the newly stocked fridges too. 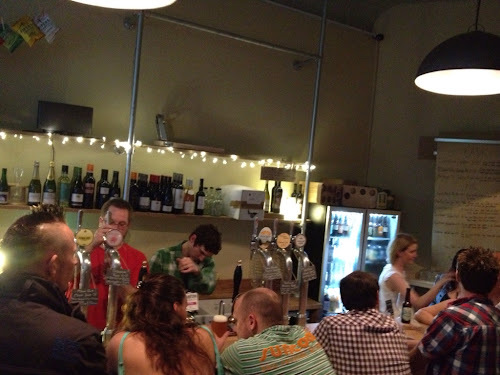 The sparkling new pumps and hand pulls served up the likes of Kernel Pale Ale, Magic Rock Clown Juice, Hawkshead Lakeland Lager, Red Willow Smokeless, RedChurch Brewery Hackney Gold, Sierra Nevada Bigfoot and a delicious Fruit beer I've never even heard of before from Delirium Tremens. The place looks great too, here are some more photos. Your friendly neighbourhood beer pourers! From left behind the bar: Tyler (previously of Mr Foleys), Kitch and Claire. 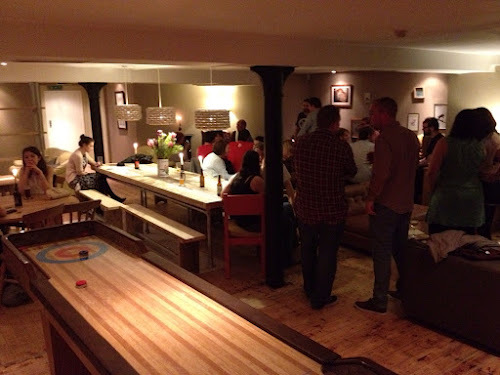 The cavernous yet cosy downstairs area and truly addictive (and free) shuffle board table. 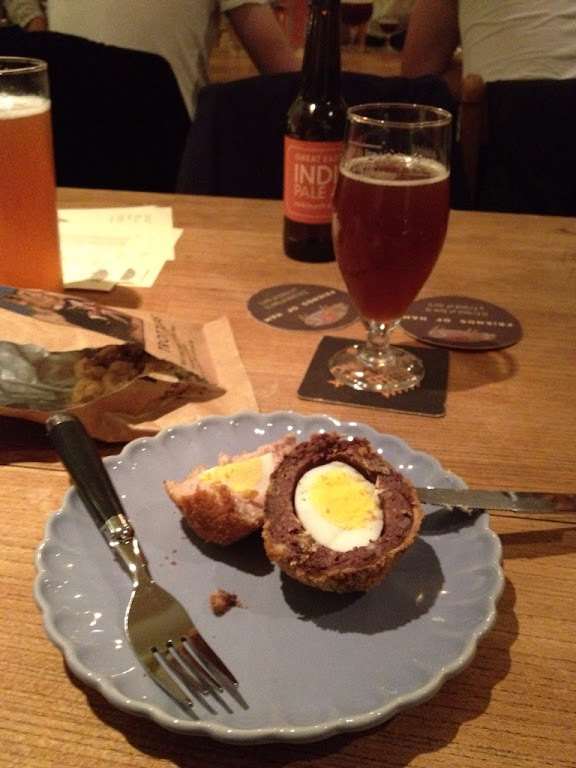 Black pudding scotch egg and Red Church India Pale Ale. Hanging hams and Lakeland Lager. I'll probably be back there this week I liked the place so much. Friends of Ham, 4 New Station Street, Leeds. I'm in Leeds next Saturday and should have an hour on my own. Might have a look at it. Is that a Bigfoot tap? Brilliant. This is the future! Sounds like my kinda place, lardo sounds intriguing..
Tand - I might be around on Saturday too so may well see you. Erlang - It certainly is a bigfoot tap, and very good it was tasting too! Big, sweet, malty, boozy loveliness. Filrd - Lardo looks pretty weird, and sounds like it wouldnt work, but it SO does. Really delicious. Can't wait to go here! I went last night.....absolutely brilliant!